The Salem College Debate Team advanced to the semi-final round as one of four colleges with the most wins at North Carolina Independent Colleges and Universities’ fifth annual Ethics Bowl held February 5 and 6 in Raleigh. Twenty-two colleges and universities from throughout North Carolina participated in the event which focused on the theme of Ethics in Technology. The judges, who were made up of business and community leaders, praised Salem and the other teams for their thoughtful arguments and broad knowledge of the topics, which they demonstrated by using relevant historical facts to state their case. 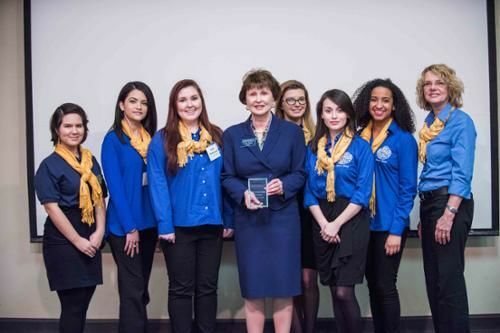 Barton College placed first and Methodist University earned second place. Montreat College also competed in the semi-final round. Salem College team members included: seniors Magdalena Chavez (Biology and Political Science), Alondra (Daisy) Mata (Business Administration), and Raechel Nelson (Teaching, Schools and Advocacy); juniors Katie Hilderbrand (Biology) and Irasema (Semi) Rangel (International Business); and freshman Keeliegh Utt (Political Science). Faculty advisor Alyson Francisco, the Mary Ardrey Stough Kimbrough chair of business and economics, prepared the team for the debate during Jan Term through a class she teaches called Debating Ethical Issues. A banquet for team members, coordinators, judges, moderators and sponsors was held Friday evening at the North Carolina Museum of History. Aaron Keane of Trailblazer Studios was the keynote speaker.